Come and experience refinement & individuality at Chicago's first Mexican Steakhouse. Steaks, Chops, Seafood with a Mexican flare. Emphasizing elevated dishes to align with the Mexican steakhouse venture, much of the menu is centered on prime cuts of meat including Bone-In Rib-Eye, Filet Mignon, New York Strip, and Pork Chops. The same quality proteins can be found with traditional Mexican twists in many specialties of the house, featuring Filet Revolucion with grilled cactus, seared queso panela, asparagus, chile pasilla salsa, and a queso fundido crust. Nonetheless, plenty of Mexican favorites can still be found throughout the menu for the less adventurous, with a smattering of guacamoles, ceviches, fajitas, carnes asadas and many other great appetizers. The impressive Lakeview location boasts three levels, including an outdoor patio and a private party room. They also offer a full service bar with an extensive wine selection, local craft beers, and hand crafted cocktails. If you're in the mood for brunch with a Mexican twist, join them every Friday, Saturday and Sunday for a $24 bottomless mimosa brunch. 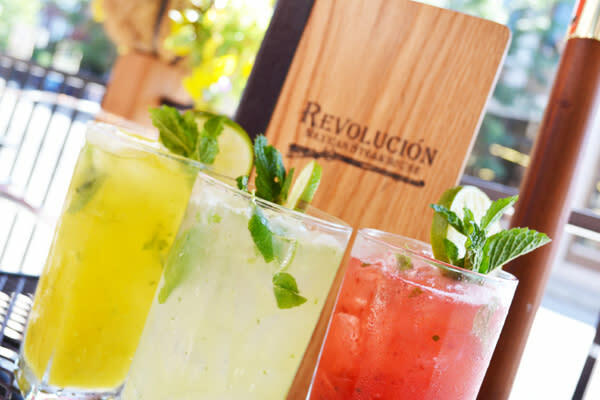 Join Revolucion for an unforgettable experience.